I've spoken to so many friends and acquaintances in the past several months who have told they have bought a Keurig single-cup coffee maker. They say, "it makes so much sense. I only need to brew one cup for me". Genius, right? Marketing-wise, yes. Otherwise, for the price they're asking, it's not at all worth it. This product starts at about $100. This one, pictured to the left is actually priced $109 at Walmart, but many of them are around $160 and up. You pair it with the infamous k-cups (pictured also) that act in place of the coffee grounds. The idea is you can pick any flavor, any brand, anything you want, including tea and hot chocolate. Simply place the k-cup in the maker and brew away for your perfect cup of coffee by the touch of a single button. While many people love this product, for me, there are at least 3 problems with the Keurig single coffee maker. 1. No one needs this product. 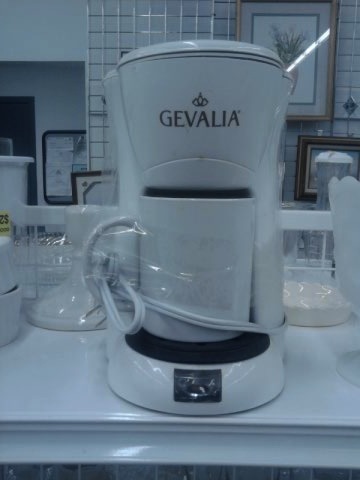 You can take a regular 12-cup coffee maker and just make "2" cups, which really is equivalent a large mug of coffee. I know this because I do it almost every morning...there's really no problem with this system. 2. 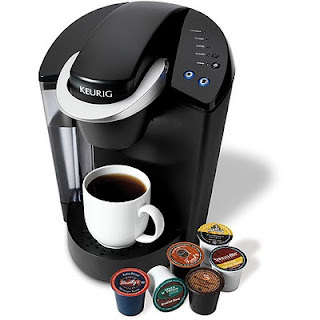 Keurig wants you to buy the little nifty k-cups for your new Keurig machine...but guess how much they run you? I checked out Target.com who is selling Green Mountain Coffee's k-cups, for example. You can get 108 cups for $59.99. That comes out to more than 50 cents each cup, even when you buy them in a rather large quantities. For that price, you might as well stop at the gas station every morning and buy a cup. 3. There are products that do this very same thing but for much less money. Here are some options: Black and Decker's Brew-N-Go runs about $20; Hamilton Beach has a personal coffee brewer for $24.99; Toastess has a single-cup brewer for only $14.99. These products are all over the web. They brew a single cup of coffee and let you use your own grounds, so your saving money from both ends. In fact, tonight I was at Goodwill and look what I found for $2.97 (pictured to the right). The Keurig has done a really good job of making us feel like we need it. Our lives will be better if we have one, and we will all be lacking something if don't. Products often evoke an emotion within us and can create an unhealthy desire that screams "I must have it! "That's great marketing. But, let's see marketing what is it and see the product for what it is. And the Keurig, sorry folks, you don't need it. Upcoming post: Save major cash on laundry detergent...how you may ask? Make your own.